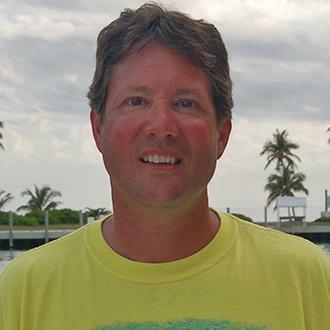 The popular aquarium fish is thought to have first been released into the wild in South Florida in the mid 1980s. 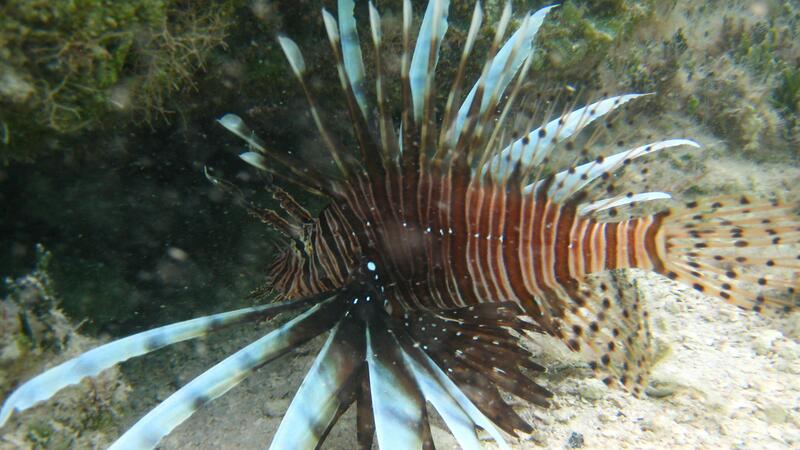 With no natural predator in this part of the world, lionfish numbers have increased rapidly. 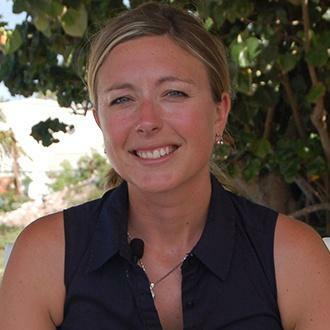 Experts say that on some Bahamian reefs lionfish have reduced native fish populations by up to 90 percent in just a few years. 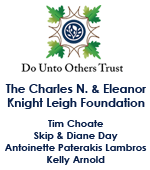 To combat this problem, experts are encouraging people to “eat’em to beat’em”. 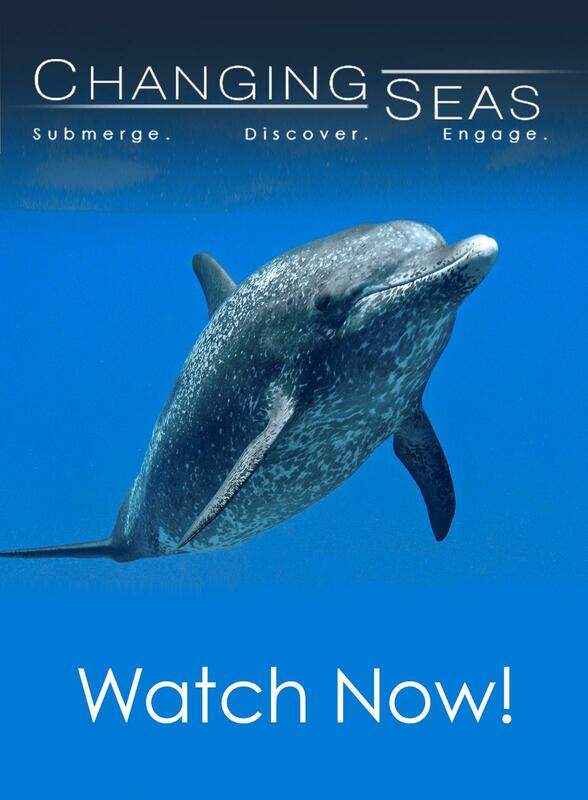 Changing Seas joins scientists in the field to learn more about this beautiful, yet gluttonous feeder and the threat it is posing to native fish populations. 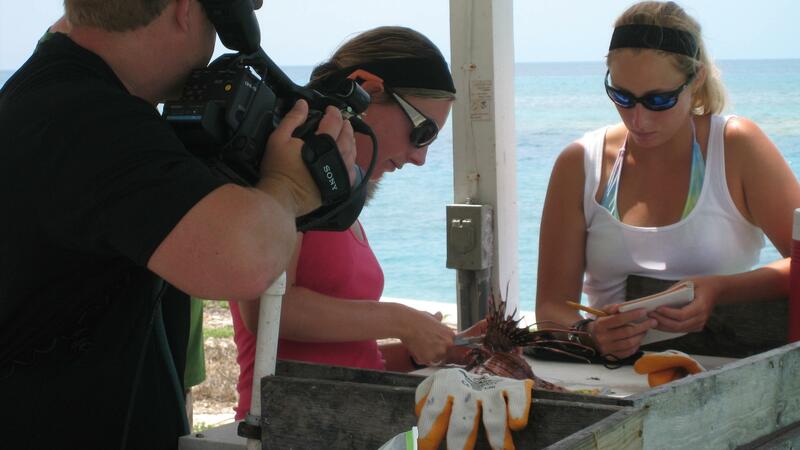 Videographer and editor Sean Hickey filming lionfish experts Stephanie Green (center) and Alecia Adamson (right) as they analyze the stomach contents of a lionfish. REEF Director of Operations Lad Akins demonstrates safe techniques for filleting lionfish. 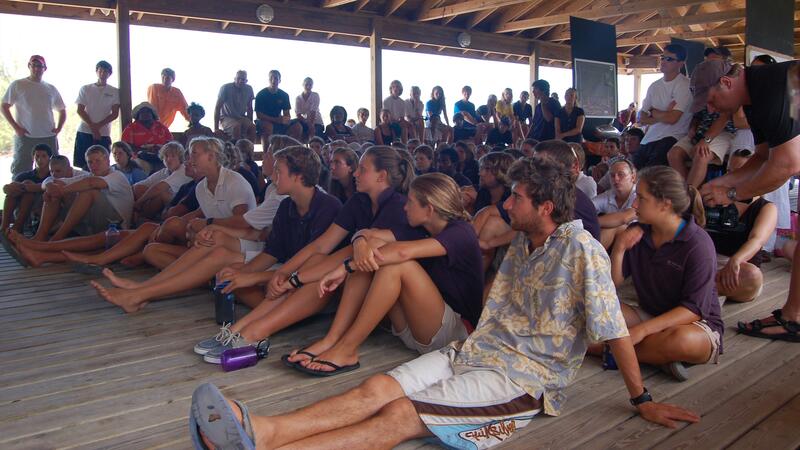 Students at the Cape Eleuthera Institute and The Island School. 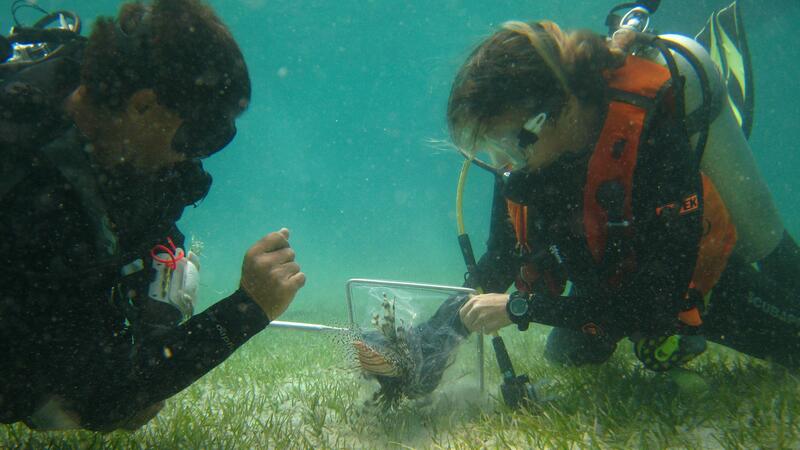 Experts and volunteers collect invasive lionfish near the island of Eleuthera in the Bahamas. 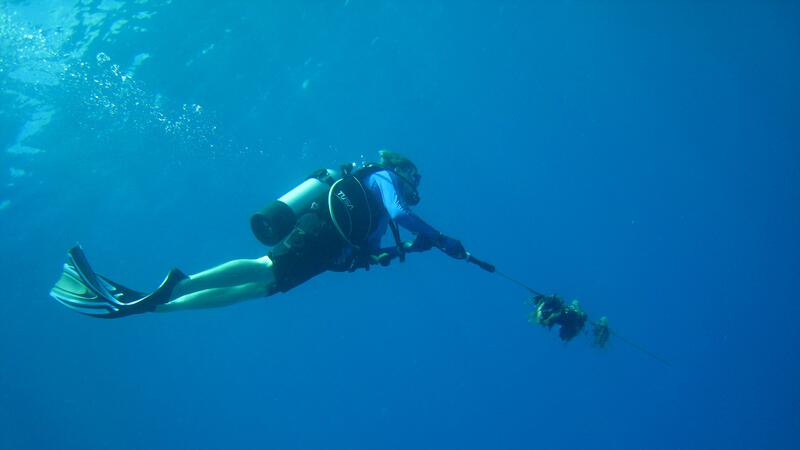 A diver collects a lionfish, an invasive species within the Caribbean, for researcher purposes. 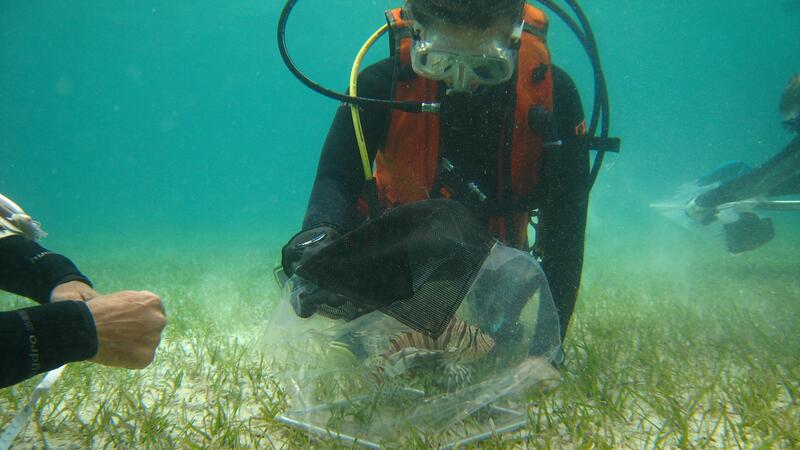 Experts and volunteers collect lionfish from the island of Eleuthera in the Bahamas. 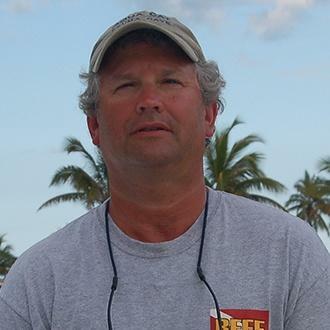 Lad Akins (left), Director of Operations at REEF. 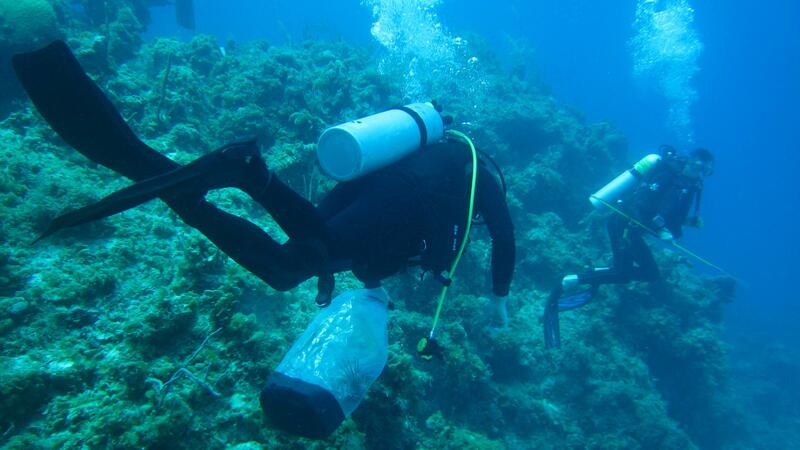 Divers in search of lionfish near Eleuthera, Bahamas. A wild lionfish displays its feather-like fins. 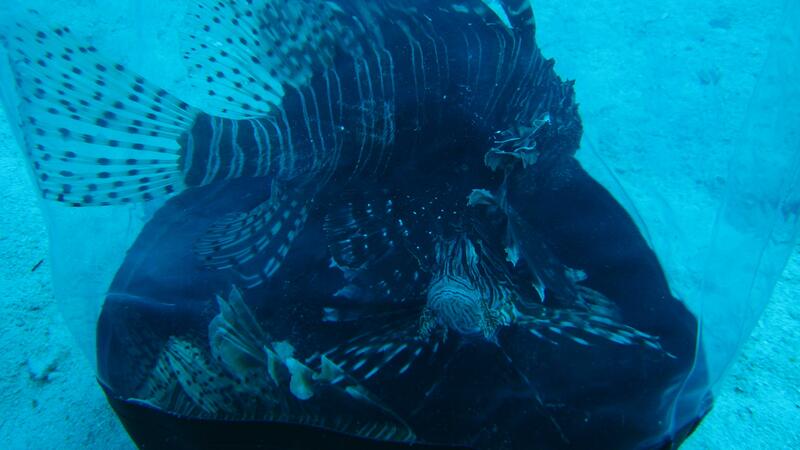 Two lionfish can be seen near Eleuthera, Bahamas. 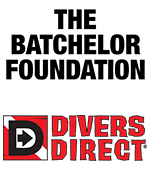 Plastic bags help protect divers from the venomous spines of a lionfish. 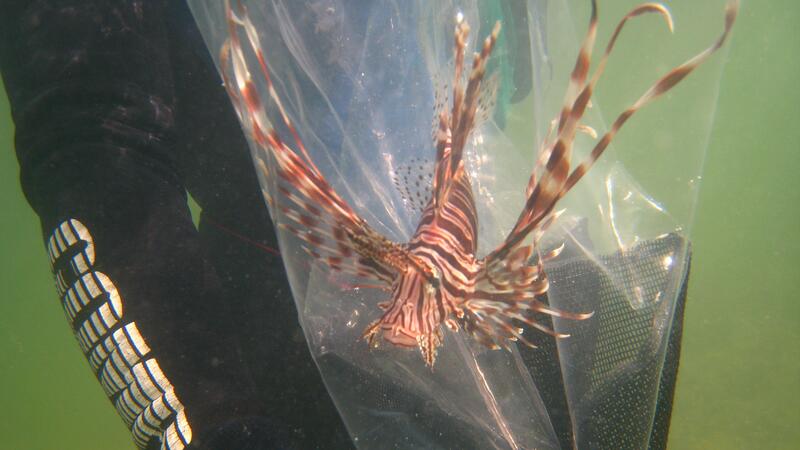 A small lionfish floats inside a plastic bag. 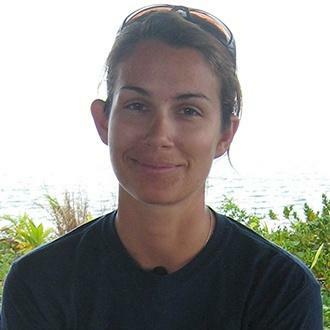 Experts in the Bahamas are collecting this non-native species for studies on population growth and other issues. 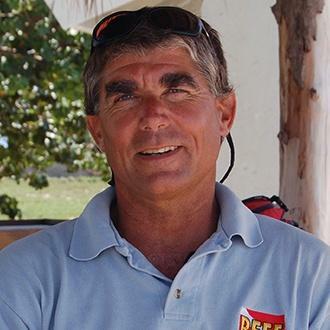 Spearfishing is one technique to collect lionfish. 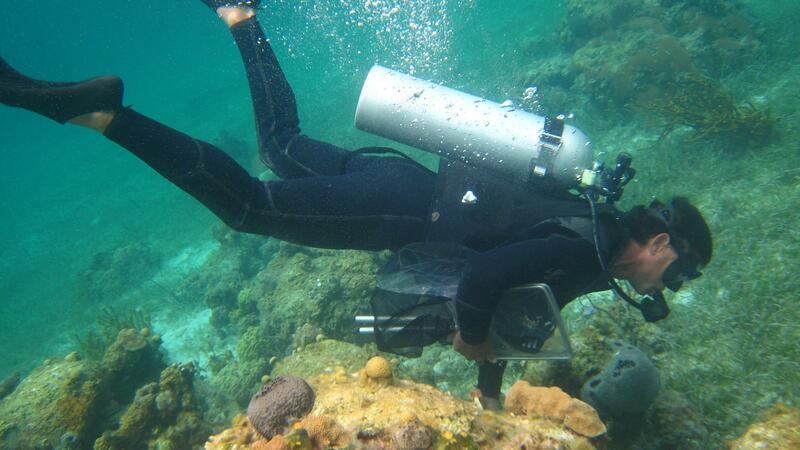 Director of Operations for REEF Lad Akins surveys a reef in the Bahamas in search of lionfish. 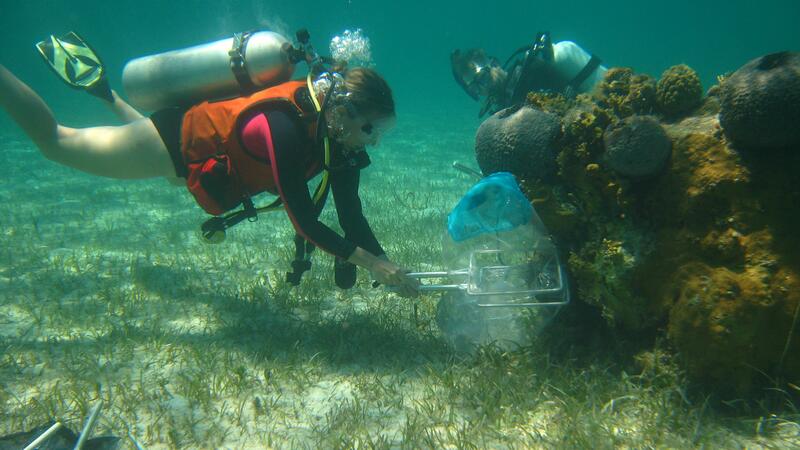 Experts and volunteers with REEF transfer lionfish from collection nets to plastic dry bags. 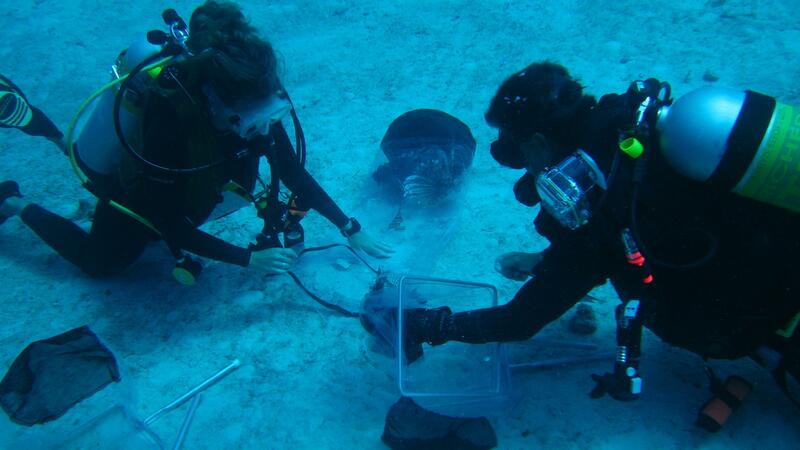 Scientists collect lionfish in the Bahamas for research on population growth and other ecological issues. 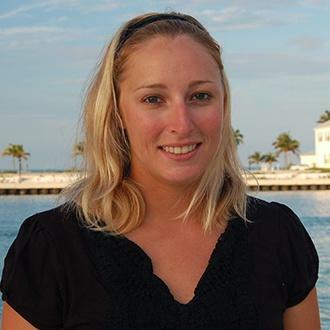 Director of Operations for REEF Lad Akins collects lionfish and records data for species monitoring in the Bahamas. 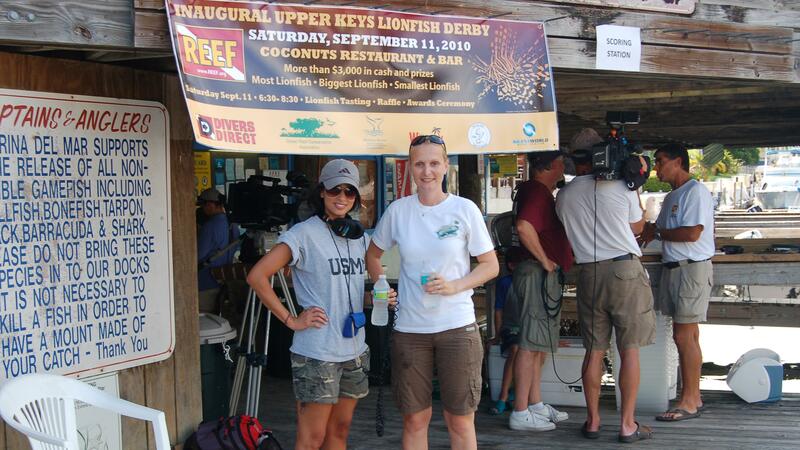 Producers Kandra Velez (left) and Alexa Elliott at the Inaugural Lionfish Derby in Key Largo, Florida. 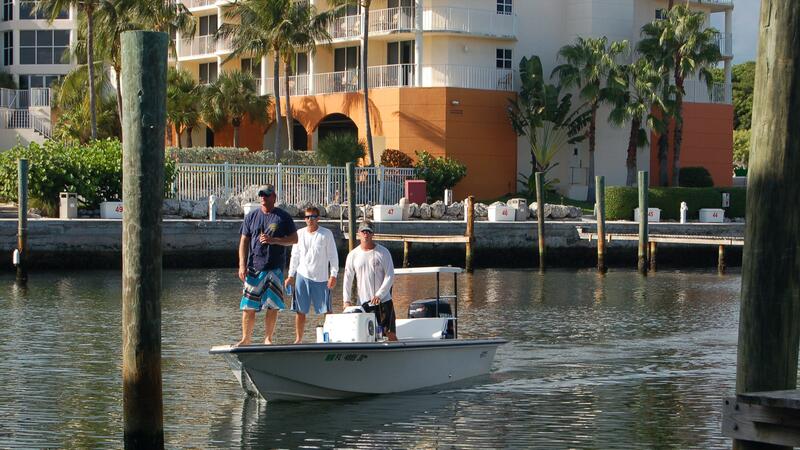 The first boat arrives to compete in the Inaugural Lionfish Derby in Key Largo, Florida. 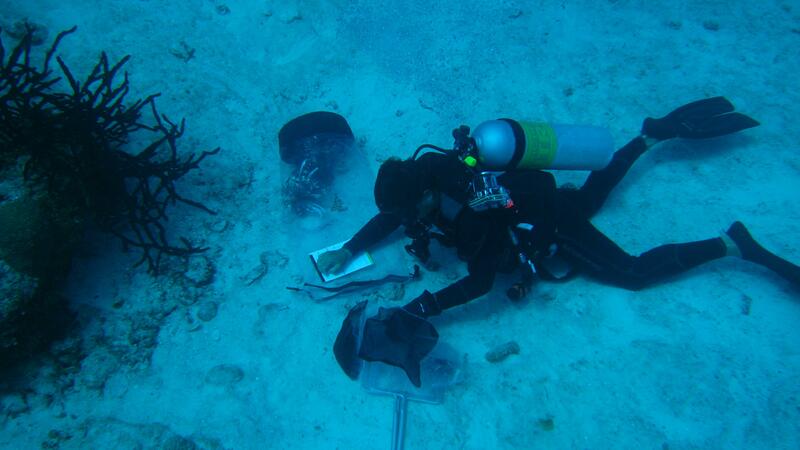 REEF's Lad Akins measures and counts each lionfish that was collected for the Inaugural Lionfish Derby in Key Largo, Florida. 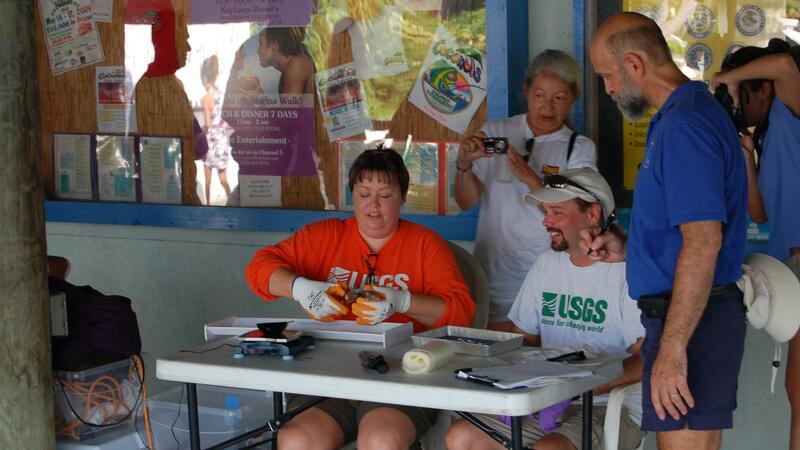 Employees with the U.S. Geological Survey record lionfish data at the Inaugural Lionfish Derby in Key Largo, Florida. 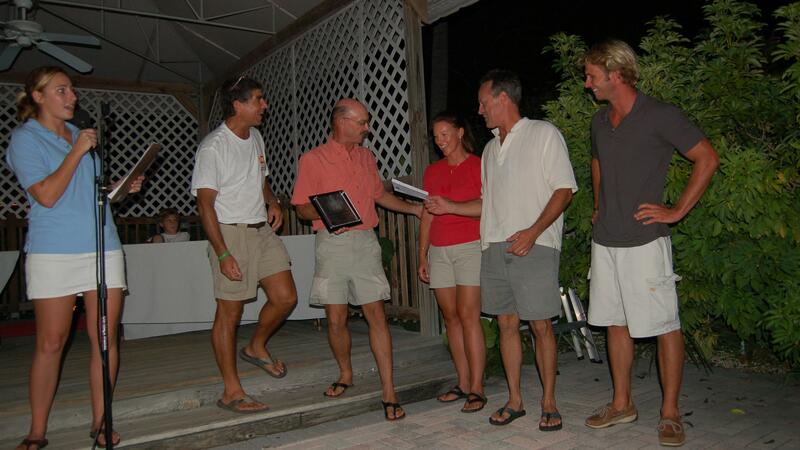 REEF's Lad Akins and Alecia Adamson award prizes to contestants of the Inaugural Lionfish Derby in Key Largo, Florida. 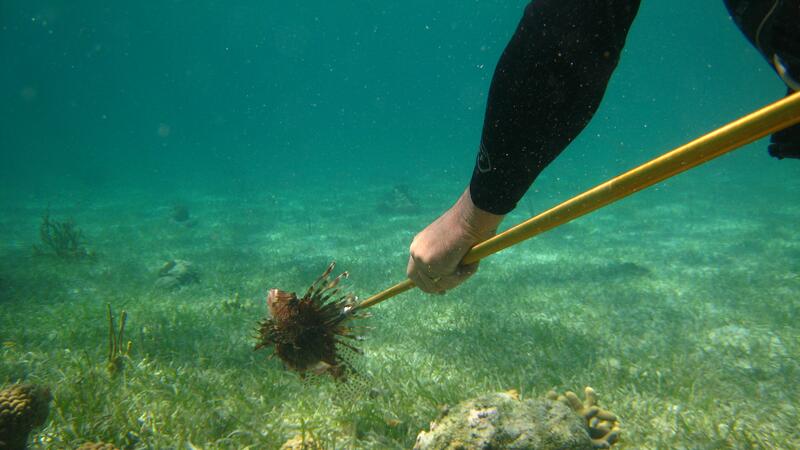 Changing Seas crew member Veronique Koch nets a lionfish in the shallow waters off the Florida Keys. 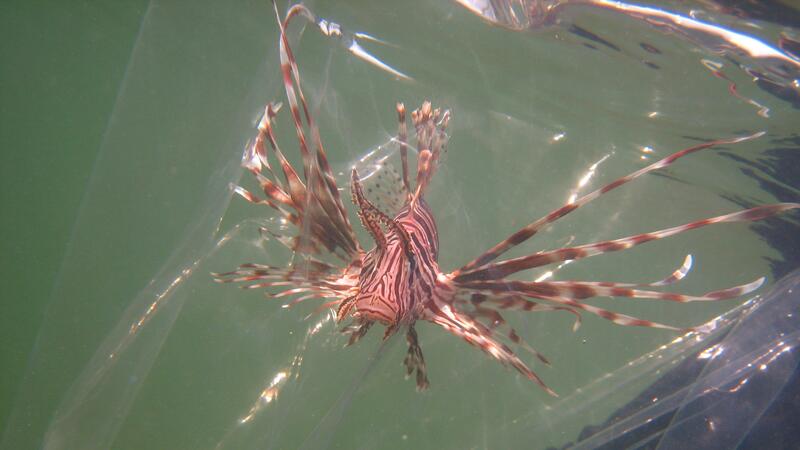 Lionfish, which are an invasive species in this region, pose an ecological threat to local marine ecosystems. It's Lionfish and Panko Thyme! A parody of "It's Peanut Butter Jelly Time!!!" 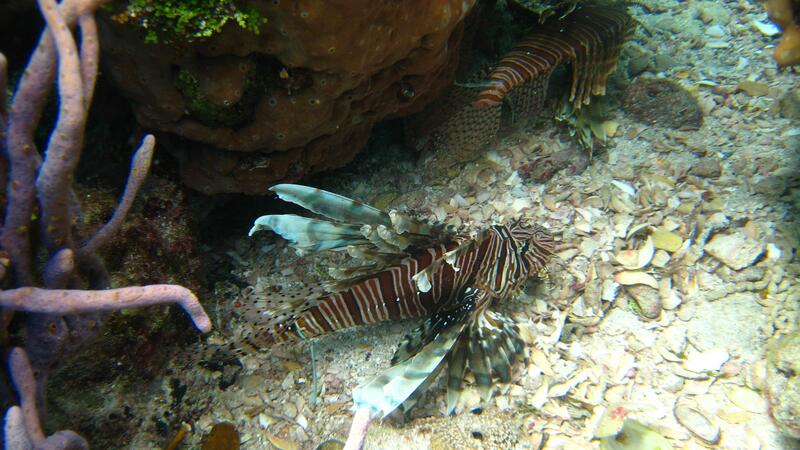 Since you gotta "eat them to beat them," lionfish are coming to a dinner plate near you. 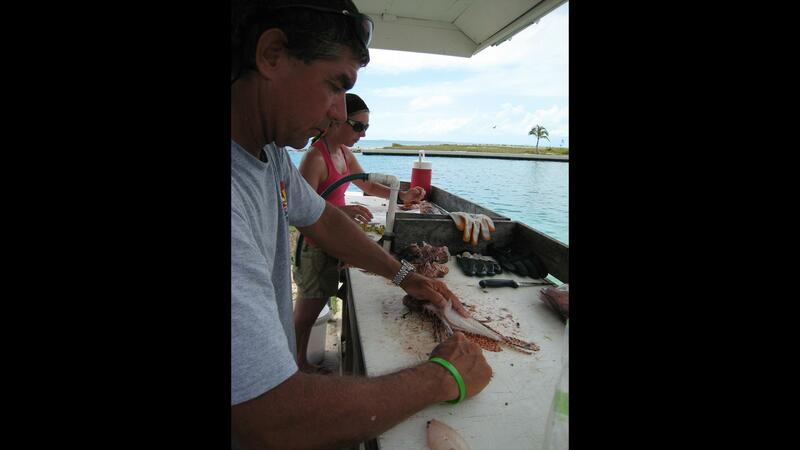 Lionfish fillets are tasty and only the spines contain venom. 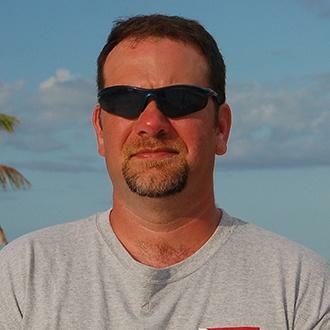 Check out REEF's Lionfish Cookbook, which is full of delicious recipes. A lionfish hunts a small damselfish. This scene was captured in 720p HD at 60 frames a second because lionfish, when feeding, are nearly impossible to catch at regular film speeds. 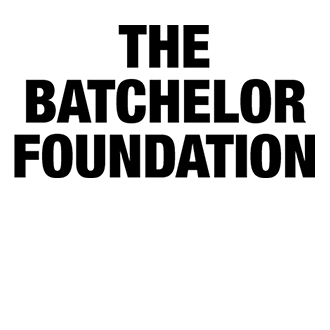 Even in slow motion, if you blink, you will miss the strike! 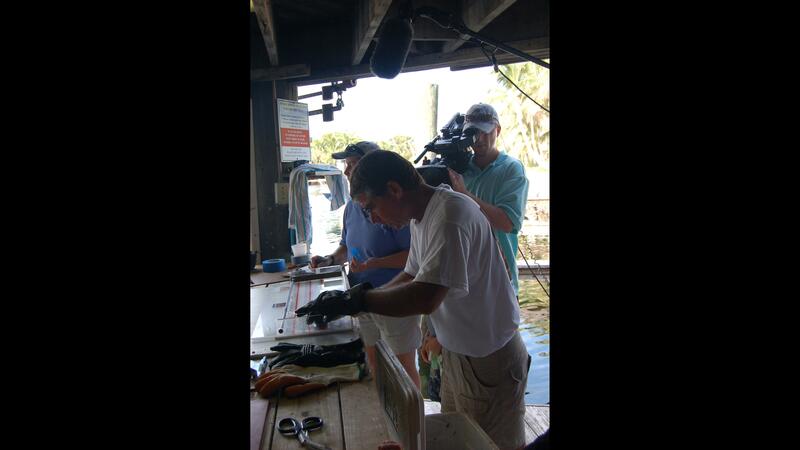 REEF's Lad Akins demonstrates how to safely fillet a lionfish. 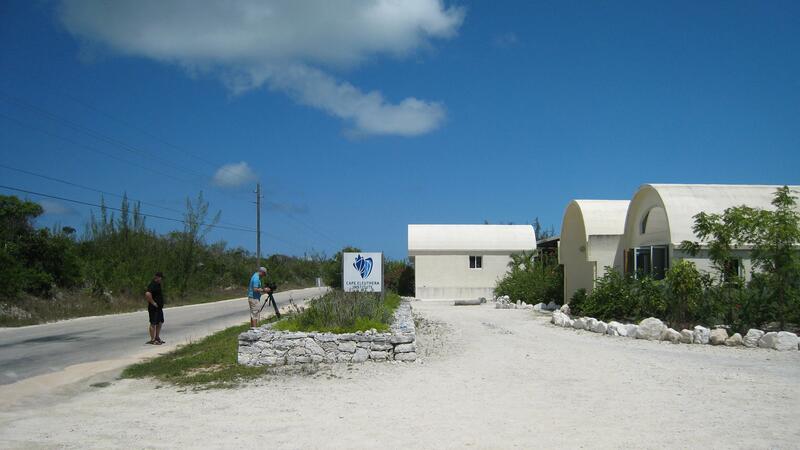 Check out this short tour of the Island School and Cape Eleuthera Institute in the Bahamas.